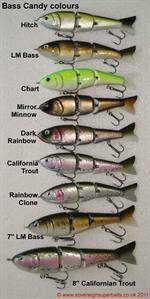 California Classic: Here we have two fantastic American swimbaits, one single jointed, one double jointed. 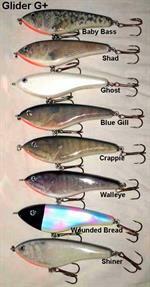 What is more they are made of wood not plastic and we all know you get a much better action from a wooden lure. These are all hand built and hand painted and retail in the States for between 25 and 35 dollars. Our special relationship with Reaction Strike enables us to bring you these two lures at a massively reduced price. Both these lures are extremely easy to work, a straight crank will have them swimming side to side like a wounded bait fish. The slightest twitch causes them to roll and flash their flanks. They have a relatively slow sink rate of around 9” per second but bear in mind they are wood and this can vary. They cast extremely well and don’t tangle in flight. 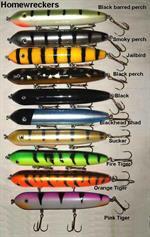 Please remember wood baits need standard maintenance such as drying and scratches touching up before reusing.